With revenue of over $600 milllion, Cole National Corporation was comprised of 3 specialty retail concepts: Things Remembered, Sears Optical and Cole Vision. Cole National's bonds were purchased by Apollo, as part of the Executive Life portfolio. Cole National was attempting to repay as much of the bonds as possible and convert the remainder of its debt obligations to equity. 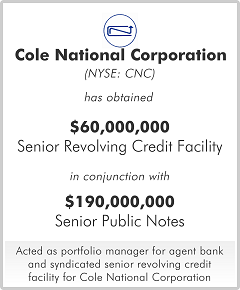 A $60 million senior revolving credit facility, including an inventory loan at an advance rate of over 90% of cost, in conjunction with $190 million of senior public notes issues by Merrill Lynch provided the necessary proceeds to complete the restructuring and provide sufficient ongoing working capital. Subsequently, Cole National acquired Pearle Vision Centers and was later purchased by Luxottica.